It turns out the internet is a fascinating place for people looking for information on food prices. The Food and Agricultural Organization (FAO) has some great price tracking tools here that allow you to make your own charts out of different commodities. 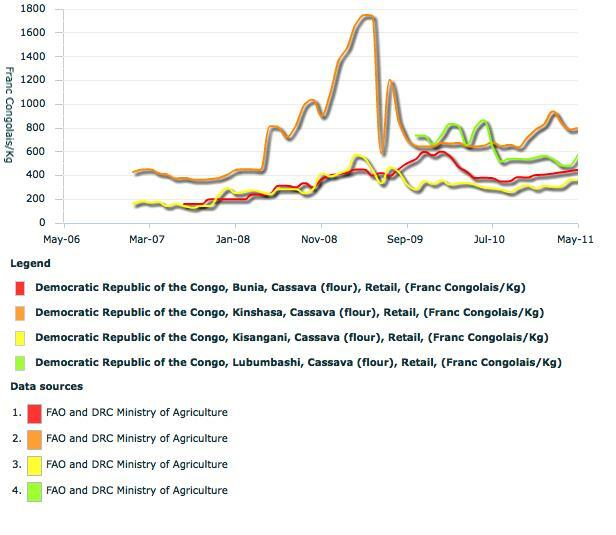 I have pasted several different charts below to give you an idea of food price developments in the Congo and their possible political importance. In the first chart, I compare cassava flour - probably the most important, cheapest staple in much of the country - in Kinshasa, Kisangani, Bunia and Lubumbashi. Two observations: Kinshasa is much more susceptible to fluctuations in the food markets, even the local one (all cassava flour is sourced locally), due to its reliance on the hinterlands for food. So an increase in fuel prices and bottlenecks in supply will affect this behemoth of a city much more than places like Bunia, where there is plentiful local production. My second observation on this chart is that, while cassava prices have risen gradually, increasing by 15-35%, they are still below their crazy peak in 2008-2009 during the financial crisis. (We also need to be a bit careful about this price index, as it is expressed in Congolese francs, which have seen 10-20% inflation over the past two years - some of the economy is still dollarized, which provides a bit of a buffer to inflation in local francs). On the second chart I compare different commodities in the capital Kinshasa - the reason for this focus is that, if there is going to be serious urban unrest, Kinshasa - the third largest city on the continent - is a likely candidate. Wheat - which is all imported - is obviously more susceptible to fluctuations in international markets, but otherwise most commodities seem to be more or less tracking levels of inflation in the country (I'd have to do a more rigorous analysis of the prices to be sure of this) and (possibly) fuel prices. 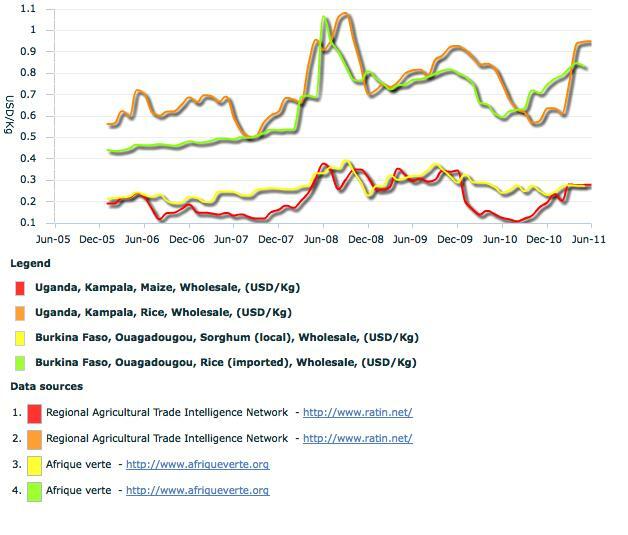 The last chart is a comparison of two African countries that have seen urban unrest linked to high food prices recently: Uganda and Burkina Faso. 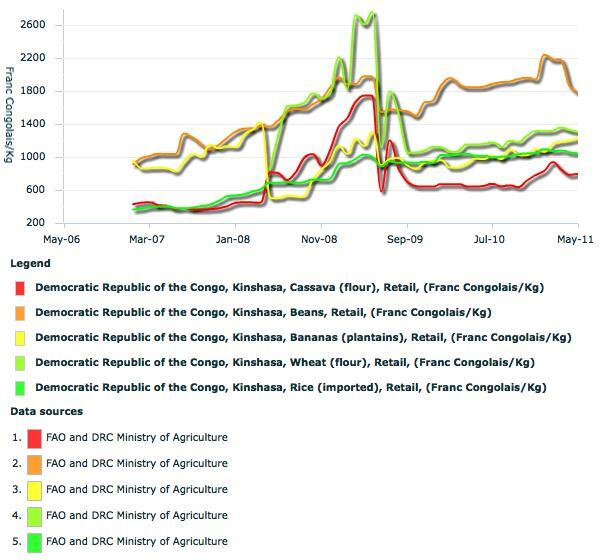 Here, the prices of imports (not the locally produced sorghum in the case of BF) has risen much more steeply than in the Congo, by 60-150% over the past year (I'm eyeballing it). I found on many local markets in rural zones in Kivu where I have been doing some research on the prices of basic commodities (cassava and maize flour, beans, salt, sugar, rice, soap), that there has been no lowering of prices in 2009, but on the contrary, a further increase. Most people explained this by the rise in insecurity due to the Kimia II (later Amani Leo) operations, which has reduced mobility of cultivators and traders (and made it more expensive due to increased military roadblocks); slowed down monetary circulation; lowered production because of fear to go to the fields and destruction of fields by violence or the military; and in some cases, the falling away of the FDLR as suppliers to local markets. While not observing that this rise in prices necessary leads to rural unrest, it does seem to contribute to undermining the popularity of the Kabila government. I have just read Francis Fukuyama—The Origins of Political Order- and your book –Dancing in the Glory of Monsters. The two wonderful reads stunningly complemented each other. As an avid follower of things Great Lakes Region in Central Africa, a better book on the subject I have not read. Your insights, buttressed by solid firsthand knowledge of what you discuss, are refreshing given the welter of ideological and blinkered interpretations of the events you describe. I particularly liked your parting shot at justifiers of invasion of DRC. The American reaction to attacks by a group out of Afghanistan is the equivalence argument I encounter often. For me the difference is simple: there was and still is a large part of the American electorate (it has grown much bigger lately) that opposed to their country’s involvement. They loudly made their voices heard and were not (in general) targeted by the state as purveyors of treasonous dissent. The case in Rwanda is very different. Congo may be a basket case that has yet to embark on the process of serous state building , however, I believe, the “strong” repressive Rwanda is a political basket case as well that will inevitably implode since there is hardly room for ventilation of the system. My two pence.